HYC – Rocking hydrogen industry worldwide. For a cleaner world of tomorrow. 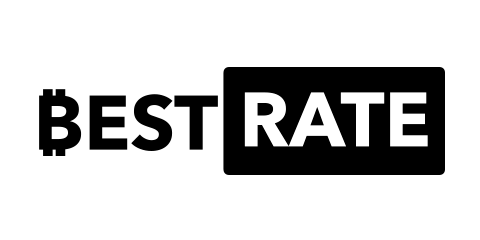 In our pre ICO we offer a discount of 10%. The price of 1 HYC token will be 0.0009 ETH. Start of the pre ICO is given in the whitepaper. Please read it carefully. ICO is set to be on 1st April 2018. During ICO the price of one HYC token will be 0.001 ETH. HYC is an ERC20 standard token. You need to have a personally dedicated Ether wallet to buy. Your bought tokens will be sent to and hold by your personally dedicated Ether wallet. Do not send Ethers from wallets which does not belong to you personally, e.g. from a wallet of an exchange account. Listing of HYC on major exchanges will be as soon as possible. HYC is not minable. Maximum amount of issued HYC will be 1 bln tokens. 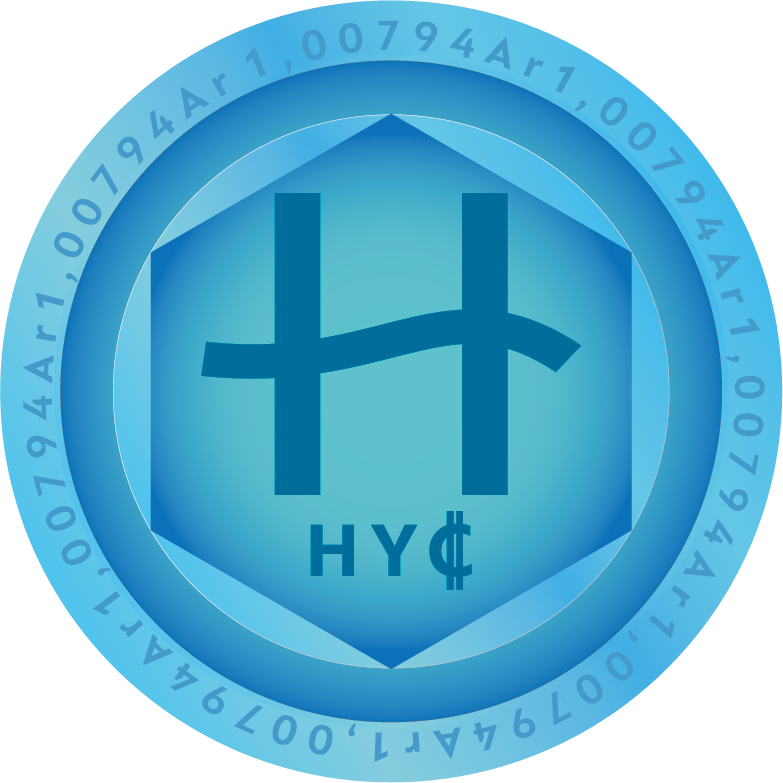 HydroCoin (HYC) is the first cryptocurrency for the blockchain community empowering hydrogen industry. 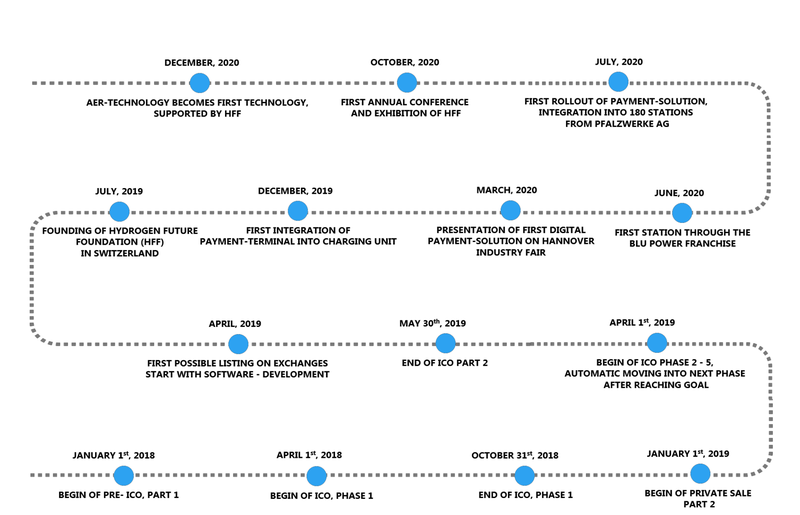 It enables the blockchain community to participate on hydrogen technologies. It will be an unique way to invest in companies, projects and new technologies for clean energy production. Several years ago we started our work based on the vision to produce energy from renewable sources only. Our motivation is: Even a vehicle with environmental friendly fuel cell and hydrogen as fuel is not clean, if used hydrogen is produced by fossil sources. One and the most famous supported project is HydroGenial. In this project a method called Absorbtion Enhanced Reforming (AER) is used to reform organic crop into a synthetic gas, from which high grade Substitute Natural Gas (SNG) and later Hydrogen (H2) will be extracted. Hydrogen energy industry is still in the early beginning. For example: Only few hydrogen gas stations exist in Germany. In near future there will be hundreds and thousands. Besides our research and development work for adequate production technologies, project scheduling and others, suddenly some successfull Initial Coin Offerings (ICO) appear in the marketplace and we were very excited about these new form of crowdfunding. Some team members were experienced a lot with cryptocurrencies, especially with Bitcoin (BTC) and Ether (ETH). We put all our knowledge together and idea of HydroCoin was born. 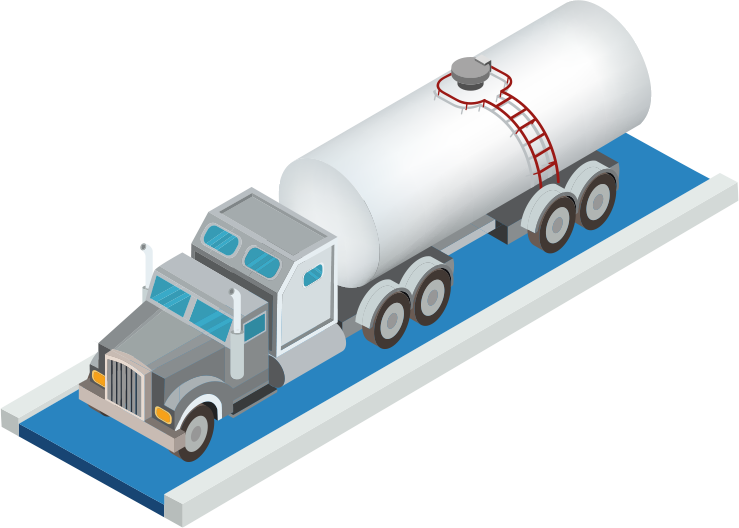 According to our concept, HydroCoin is not only a tradeable value, it is also a certificate and a customer payment solution for fuel at gasstations. In future the owner of HydroCoin will be the Hydrogen Future Foundation. Members will vote for projects to support. 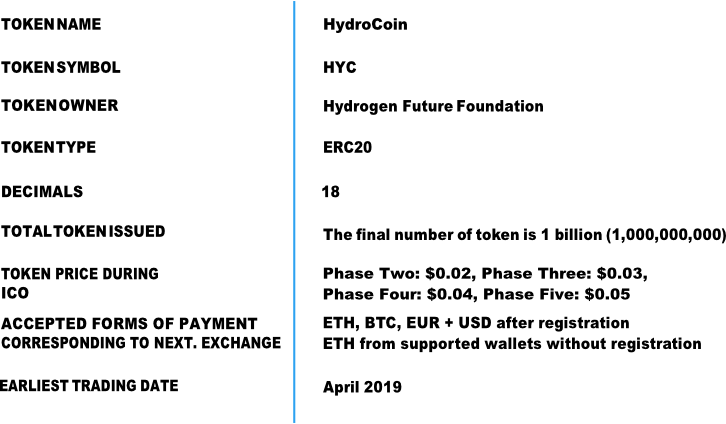 Earliest trading day for HydroCoin will be October 1st 2018. The price of HydroCoin will depend on market activity, availability of clean energy and willingness of customers to buy those. Our Smart Contract, uploaded to the Ethereum blockchain, manages as an unstoppable and self-directed application the proper distribution of HydroCoins. It takes care, that the right amount of HydroCoins were send automatically, when Ether is received. On BUY TOKEN page you can find information how to buy. You can participate. Don`t wait. Please read carefully our whitepaper. We will build up an infrastructure of min. 100 Simple. Fuel Stations and 1000 wall-mounted 20kW EV-charger with dual-output (DC quick-charging with CCS/CHAdeMO AND AC-charger Mode-3 Type 2). HydroCoin is influencing the change of energy consumption, which requires a combination of energy, the blockchain, crowdfunding, market trading, independent energy supply knowledge and experience. HydroCoin combined its team looking at this mix of expertise needed to create the cleaner tomorrow. If you are interested in HydroCoins (HYC), click “Notify me!” and you can signup to our Newsletter.